Run the River with Queens Library! 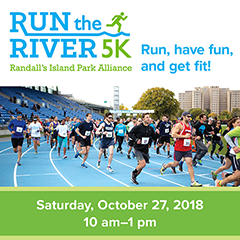 Once again, Queens Library is partnering with the Randall’s Island Park Alliance for Run the River, a 5K fun run on Randall’s Island, on Saturday, October 27! Now in its ninth year, you can run to protect the waterways, wetlands, and recreational areas of Randall’s Island Park. Plus, it’s a great way to stay active and boost your fitness. Enjoy beautiful scenery, a post-race party, a children’s fun run, prizes, and giveaways. Run the River is a great activity for novice runners, seasoned racers, and families looking to break a sweat together in the great outdoors. Register now and get $5 off the entry fee! Simply enter the Queens Library promo code 18QL at checkout. Register Now for the Run the River 5K!